The LCO-140H which stands for “Low-Cost of Ownership-1st 40-foot Hybrid” was developed under the BUSolutions program in partnership with Automation Alley, in an effort to revitalize public bus transportation in America. On the MPG criteria, the LCO-140 achieved an industry high fuel economy of 6.9 mpg when tested using the downtown “stop-and-go” duty cycles and test protocol established by the Federal Transit Administration (FTA) for transit bus certification testing. Now before you think that MPG is low, consider that compared to the database of buses tested at Altoona, where the FTA certification program is conducted, the LCO-140H fuel economy results are rather impressive at 110 percent better than conventional diesel buses and 30 percent better than the leading diesel-electric hybrid buses available today. From an economic perspective, it’s the total cost that has to be considered. On that front, BUSolutions is projected to lower the cost of ownership by $170,000 per bus as compared to a conventional diesel bus. With the average local transit authority operating approximately 300 buses, the savings could reduce a city’s cost of transit bus operation by approximately $50 million. When compared to an estimated $27 million increase in operational costs for a similar electric hybrid fleet, it is clear the LCO-140H could revolutionize the transit industry by providing reduced fuel consumption and emissions while improving the fiscal performance of a regional transit authority. I was fortunate, thanks to Jenn Korail of airfoil.com , to have met and interviewed Jeff Brennan, Chief Marketing Officer for Altair at the MBS 2011 in Traverse City last month. His offer to attend the BUSsolutions event was immediately accepted by me because of my technical interest, and it was in Troy, MI not far from my home. Win-win! Speakers at the event included, James Scapa, Chairman and CEO of Altair; Jeffrey Brennan, CMO, Altair; Mike Heskitt, COO, Altair; Martin Dober, Mich Econ Dec Corp.; Maureen stood in for L. Brook Patterson, Oakland County Exec (who had a death in the family); Walter Kulyk, Federal Transit Administration; Ken Rogers, Automation Alley; and Louise Schilling, Mayor, city of Troy. When finished, all were given a ride in the bus where we received the same experience as though we were ferried along city streets as any other bus, along Big Beaver, south on John-R, and a some avenue I failed to note because I was more interested in the ride itself. My own perceptions were one of immediate acceptance that the serial hydraulic hybrid technology is no longer a test bed in a lab, but a real, drivable vehicle. That alone is a significant win for Altair and its team of engineers and partners. Furthermore, it proves that hydraulics can compete on a functional and performance scale as any other bus and at a considerable cost savings to transit authorities. Frankly, I always suspected that, having worked in hydraulics in the Navy and afterward for a few fluid power companies, but couldn’t prove it by building a bus. My only negative on the ride was the noise. However, ALL busses are noisy, bar none. But this one has a different noise in that you hear the charging of the hydraulic pressure tanks by the engine. In other words, it’s not a matter of noisier, but a matter of a different sound frequency, because it meets all the decibel requirements. So, the difference as I perceived it was truly the pitch of the sound; and that is surely an issue that can be mitigated via insulation and possible reengineering the valves to adjust the sonic speed of the hydraulic fluid; plus we have the technology via electronics to induce counter noise measures. What’s most important, though, is the feasibility of the technology. I rode, I heard and I returned safely. Isn’t that what public transportation is all about? I have to admit, my first thought was that the hydraulic drive was merely for stop and go, and the engine would drive the highway speeds directly, but I was wrong. This is truly a serial drive whereby the engine does not directly drive the wheels ever, but through the mechanism of a hydraulic pump which drives a hydraulic-powered motor to the wheels, not electric. There have been other hydraulic drive trucks under development, but never for a bus. Those were designed for picking up garbage where stop and go is chronic, and nobody gives a darn about any noise. Nonetheless, the LCO-140H is a first in that it is a diesel-hydraulic propulsion system to transport people, whereby the diesel engine can operate always at its most efficient speed since it merely charges the hydraulic pressure tanks. The engine options are open, too. As you know I have written extensively about split-cycle engines like Scuderi and Tour, and opposed piston, two-cycle diesels like Achates Power, and the Cyclone Power external-combustion engine to name a few. Fact is, any of these engines could be used in lieu of standard diesel motor. Here are my videos of the events. First is the Media Day Intro where the bus enters behind the podium. The next video shows all the speakers. However, I apologize to the Mayor of Troy, Louise Schilling, because I had a camera memory card glitch just before she spoke. Finally, here is the video of the actual ride inside the bus. Note the sounds of the hydraulics; not as loud on the video as in person; but I also noticed listening to the video that I became less aware as time passed by. The LCO-140H Bus will be displayed at the American Public Transportation Association (APTA) EXPO in New Orleans Oct. 3-5. Held every three years, APTA'S EXPO is public transportation’s premier showcase of technology, products and services. 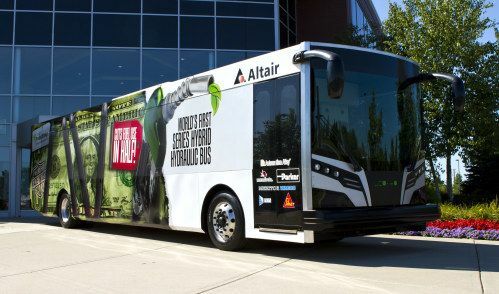 Altair also intends to pursue a commercial plan to produce the bus.